Mamu’s shradda was on Thursday. After someone dies in the family, if you are Nepali Hindu, you have a priest perform puja (religious prayers and worship) for that person every month for a year. After a year is up, you must do it once a year, on the day he or she died. This is called shradda and is done to feed the deceased. On Wednesday, the day before, Tri, his brother, and his dad had to refrain from eating meat and eggs and could only eat one meal of daalbhaat (rice and lentils). We weren’t sure if I was supposed to fast or not so to be on the safe side, I didn’t eat meat or eggs either. And I actually made a mistake that day. Usually we have rice in the morning and roti for dinner. Because I had eaten about 6 rotis for lunch (they were really good), I didn’t want to eat them for dinner, so I made myself some rice. After I started eating, Tri’s brother told me I wasn’t supposed to have more than one meal with rice the day before shradda. On Thursday morning, Tri and his brother had to fast until the puja finished. All of this fasting has to do with purity. To partake in the puja on Thursday, Tri and his brother had to be pure. Neither I nor my father-in-law were part of the puja for my mother-in-law because only the sons of the deceased have to perform shradda, so we didn’t have to fast that morning. 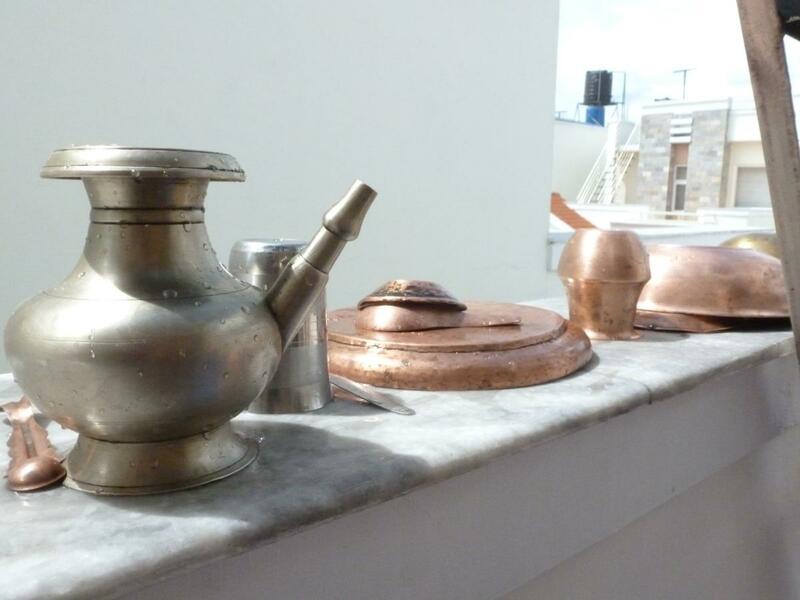 After the priest came over, he arranged some flowers, fruit, and spices in pots specially used for puja and in bowls made from dried banyan leaves. After he finished getting ready, Tri and his brother went to the roof of the house, where the puja was taking place. The priest recited prayers, gave them some special water to drink, and gave them each a new sacred thread to wear. The long white string is worn like a sash inside of the clothing. Traditionally Hindu Baun (Brahman) men were supposed to wear this sacred thread all the time, but I don’t think it’s as common today. After the puja finished, we all sat down to have daalbhaat. On Friday, we had another shradda for 16 generations of my father-in-law’s ancestors. This puja occurs only once a year and is also done to feed the ancestors. 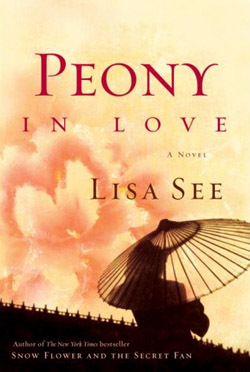 It reminds me of a book I read by Lisa See called Peony in Love about a young girl in China during the 17th Century. I’m skipping over a bunch of the story, but from what I remember, the main character dies and becomes a ghost. However, because her funeral rites do not happen as they should and no one in her family sends her offerings, she starves in the afterlife. We were talking about this tradition in the context of Hinduism, and Tri made the point that if your ancestors have already been reincarnated, why would you need to feed them? I’ve learned a lot about Nepali Hinduism in the last few years, but I still have so many questions.